When most people have allergies, they know it. Symptoms come quickly and can range from mild reactions like sneezing and itching to severe, often debilitating effects like anaphylaxis. Millions of others, however, suffer from allergies and don’t even know it. Allergies and intolerances are often the hidden culprits that lie at the heart of a number of health conditions. 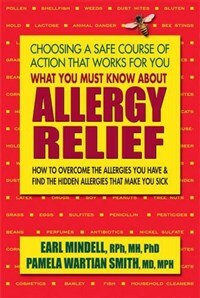 If you are an allergy sufferer or have a recurring health issue that you can’t seem to resolve, What You Must Know About Allergy Relief is the book for you. Written by a pharmacist and medical doctor, it provides important answers to the most common questions about allergies—what causes them, how they can affect your health, and most important, what you can do to overcome them. Written in a clear, reader-friendly style, this book is divided into three parts. Part One presents an overview of the causes of allergic conditions as well as their most effective treatment methods—both conventional and alternative. It also addresses the growing epidemic of food and environmental allergies, especially among children. Part Two offers sound advice and practical tips for dealing with asthma, skin conditions, and other allergic reactions both at home and in the workplace. It provides helpful tips for allergy-proofing your home, minimizing allergic reactions to pets, and knowing how best to prepare when traveling. In Part Three, the authors provide a comprehensive guide to anti-allergy medications, supplements, and other treatment options. Beautifully written, easy to understand, and up-to-date, What You Must Know About Allergy Relief offers the tools to identify hidden allergies as well the means to relieve their symptoms. With this book in hand, you can make the informed decisions you need to restore your health. Pamela Wartian Smith, MD, MPH, is a diplomate of the American Academy of Anti-Aging Physicians and director of the Master's Program in Medical Sciences, with a concentration in Metabolic and Nutritional Medicine, at the University of South Florida School of Medicine. An authority on the subjects of wellness and anti-aging, Dr. Smith is also director of the Fellowship in Anti-Aging, Regenerative, and Functional Medicine. Currently, she is the owner and director of the Center for Healthy Living, with locations in Michigan and Florida. Dr. Smith is also the best-selling author of What You Must Know About Vitamins, Minerals, Herbs & More and What You Must Know About Women’s Hormones.